Who doesn´t know Henry Ford’s T model; the first four-wheeled automobile in the world and stood out for using rubber wheels. 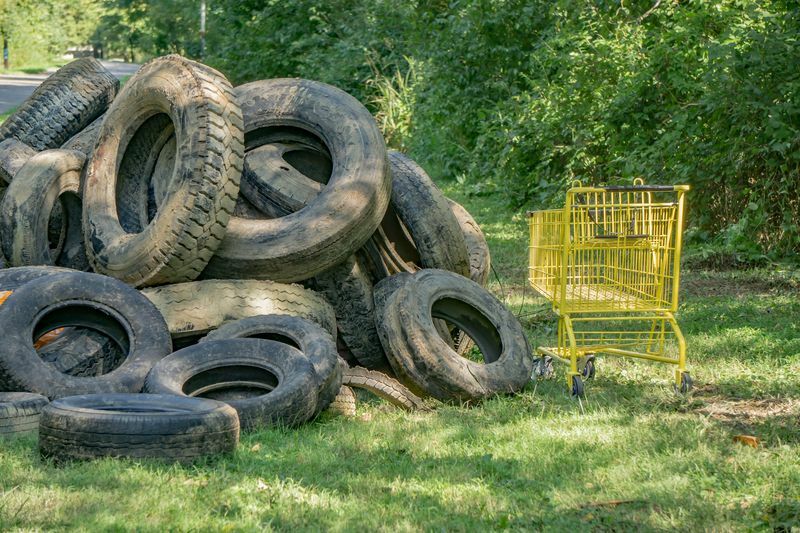 How many scrap tires of the T model will still exist in the landfills of the world? This was the first car built on a large scale in several countries; it was the most desired car among all people for its innovation and design. The first model had wooden wheels and in 1926 began to be replaced by metallic wheels. This model was gradually evolving until, due to the great technological advances, its production ceased when they reached approximately 15 million units produced. This means that at least 75 million tires were produced at this time (not counting additional spare tires). Imagine in the early 20th century we started with a waste of 75 million scrap tires that had no controls on where they should be thrown. Many of them ended up in rivers, oceans, landfills, in the streets, and many others do not know where they are. Unfortunately, the damage that the tires caused to people or the environment was not known yet; even, it was popular knowledge that they had to burn to get rid of them. It was not until many years later that it was discovered that the worst thing that could be done was to burn the tires outdoors. The manufacture of the tires has changed a lot over time. Currently the tires need more than 200 ingredients for their manufacture that help the tire to be safe, that help the tire and fuel last for a longer time. Usually the components are rubber, agents that reinforce the durability of the tire; metal reinforcement and textiles that work to geometrically shape the tire providing rigidity. Finally, numerous chemical agents are used that provide different properties to the tires depending on the cars and the terrain for which it is made. Tires usually consist of nine major parts. The first layer is the inner liner which is an airtight layer may be of synthetic rubber or a pneumatic chamber. Above the inner lining is the body plies which is made of strings of textile or steel fibers glued to the rubber layer of the carcass. These cables determine the strength of the tire and are able to withstand the pressure. The edge cover area is where the tire has grip to the metal wheel. The edge cover is the area that held against the tire securing the rim and is made of steel wire. An average car can withstand a capacity of 31, 746 pounds. The sidewall of the rim is the one that protects it from edges or impacts; and where are written the characteristics of each tire as when it was fabricated, measure, speed range, capacity, suggested terrain, among others. The tread determines the force of the rim. It is made of very thin steel ropes that make the rim not expand rapidly with friction and tire rotation. This layer is very strong and is able to withstand potholes or other obstacles. The reinforcement layer is responsible for reducing the heat of friction and is responsible for preventing it from deforming or exploding at high speeds. This layer is made of nylon cords that adhere to the rubber layer on the surface that rubs against the ground. And finally, the tread provides traction and grip on the turns. When the drawings begin to lose is where we can see the wear of the tire and loses traction as well as resistance to heat and finally end up being used as scrap tires. The last layer of the tire can determine much of its performance; the grooves we can see on the surface of the rim (the part that makes friction with the floor); although it seems that they are simple drawings; the different designs on the tires have decisive functions for your safety and the terrain you want to drive. Before buying a tire check out the number of grooves it has. If the desing has many large grooves or many channels it means that its grip on wet surfaces is better because it pumps the water better. The slots extract the water from the tire and the road, removing water every second making a safer travel. The shape of the drawings will be the way in which the water is drained; it can be directional, symmetrical or asymmetric (each pattern has a use, not just for it to look pretty!). The thin tread openings improve traction, help the edges drain water and serve for wet or frozen surfaces. Instead, if you are looking for a tire for dry surfaces you should also look at the number of slots. The smaller the grooves will have better grip because there is a larger surface of the tire touching the floor. There are slots that have many patterns, but there is a technology that are self-closing. That is, the apertures become narrow when they are loaded to provide stability to the truck and prevent accidents. By choosing the right tires for the terrain and climate in which you will use them, you will increase their life time, reducing the amount of scrap tires and at the time you are going to change it, make sure that the place where you make the delivery recycle it. Otherwise, we invite you to bring it to our facilities; at Globarket we have a tire recycling plant that processes scrap tires, contact us to make an appointment, we will be very happy to help you.